In Jeffery Gitomer’s book, Customer Satisfaction is Worthless, Customer Loyalty is priceless, he discusses how you handle customer interactions. When I first learned about this book, I worked for Ferguson Enterprises. Ferguson is a worldwide plumbing and HVAC supply house. Most of the customers are builders and tradesmen. One example that we discussed when studying the book was special order shipments. Here was the scenario: A plumber has ordered a special order tub for a client. The plumber was told by us that the tub will be delivered to his warehouse on Thursday. On Monday, we get an email from the distributor that the special order tub was not shipped and now the tub would arrive next Monday. What do you do? With the goal of meeting and exceeding customer expectations to life satisfaction, loyalty, and advocacy, customer experience fall into one of five levels based on how they are triggered, the amount of effort required by the customer, the completeness of the resolution, and perhaps most important, the emotion and change in perception the customer has as a result of that experience, research firm Gartner assets in a new report. The levels, from lowest to highest, are dubbed by Gartner as communication, responsive, commitment, proactive, and evolution. The communication level is about getting the customer the right information in the right channel at the right time. According to the report, success at this level improves inbound traffic, increases the marketing funnel and decreases call volume; failure results in lost opportunities for the company and frustrating experiences for the customer. 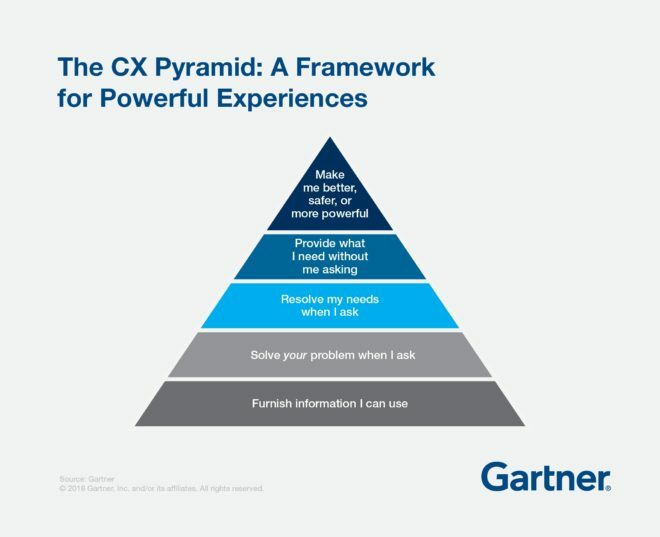 Looking at the case study: If we only wanted to climb to the bottom rung of the customer experience pyramid shown above, we could call the customer and “furnish them with information I can use.” We would tell the customer the news about the tub. Maybe we apologize but at the end of the day, it is the distributor’s fault, not ours. The report asserts that it’s important to move to the next level, noting that building strong relationships with customers requires doing things for them, not just saying things to them. The responsive level, therefore, involves addressing customers’ needs in a way that minimizes resources and costs. Doing this right, according to the report, allows companies to optimize efficiency metrics, such as call handling time and customer self-service rate. To move up to the second level of the pyramid would require us to “Solve your problem when you ask.” So after we called the plumber and he was not happy with our news and he asks what we can do to fix it, we tell him we will look into it and get back to him. Companies need to move to the next level because, as important as efficiency metrics are for improving operational performance, they fall short when it comes to determining company impact on customer perceptions and outcomes, the report says. At the commitment level, creating experiences requires companies to listen for, understand, and resolve customers’ unique needs. According to the report, experiences at this level are created and measured with an eye on balancing short-term financial and business metrics with leading indicators of customer relationship strength. The report cites Zappos as an example of a company at this level: One of its call center representatives spent more than 10 hours with one customer, a feat that the company used to exemplify its commitment to its customers. For this level of the pyramid, because the client asked for help, we called around and found out that a Ferguson Branch 90 minutes away had the same tub they were holding for a plumber that needed the tub in two weeks. So we sent a truck up, picked up the tub and delivered it to our customer on the original day. We then called the distributor and had them ship the tub to the other branch and they were able to deliver the tub to their customer on time as well. Many people would look at this level of customer service and say that was pretty impressive. But there are still two levels above this solution. Again, though, it’s important to move to the next level because the best companies find ways to identify and resolve customer issues before they occur. At this proactive level companies deliver experiences that address customers’ needs and wants before they ask or even know that they have them. According to the report, this involves having a deep understanding of customers, acting proactively and constantly surpassing competitors in resolving customer needs and wants. The report cites Nest as a company at this level. The company disrupted the thermostat market with a smart product that programs itself, managing home temperature for maximum efficiency and comfort. Our solution to bring the customer into this level of customer experience at Ferguson was after we got the call from the distributor we first asked if there was a way to expedite the shipment. There wasn’t. So then, before calling the customer, we found the Ferguson Branch with the tub that was 90 minutes away. We got them to agree to the swap and then we called the customer to let them know what we were doing. The conversation went much better because of the client asking us to fix the problem, we were telling them how we had already solved the problem. The final level – evolution – is elusive, but companies should strive to reach it nonetheless, the report says. The few companies that have gotten there possess the kind of customer devotion and enormous reputation that yield “profound and sustainable business outcomes.” Companies at the evolution level deliver experiences that alter the way consumers think about them and about themselves and foster customer relationships with prolonged retention, higher margins, and increased lifetime value. The report cites Apple’s introduction of the iPhone in 2007 as an act that not only changed the way people think about mobile computing but also their own lives. This level of customer experience is not only about these type of one time issues, but also an ongoing improvement of the offerings we provide to clients. This is what Gitomer calls the “WOW moment.” As we studied how to provide this level of service for this particular issue, we tried to answer, how do we make the plumber better, safer or more powerful? One of the ideas that we generated was to provide this online. Picture the Pizza tracker that Dominoes has. What if your Ferguson orders were track-able? What if you could change the delivery location, delivery date, or change the shipping method without having to talk with us? You need to communicate with your clients to determine what they need to be able to rank you in the top tier of the pyramid. “If your goal with your customer experience is to reduce costs or reduce headcount, then you’re really not focusing on the customer,” Says Augie Ray, research director at Gartner and author of the report. “Another problem often is not really understanding what customers want and need. Many companies don’t have a very good listening program or customer insight program. Oftentimes brands do a lot of market research, which helps them to understand what their opportunities are in the marketplace; they don’t always do a great job of probing what customers need and want and unless you know that you cannot make smart decisions about being at the top of this pyramid.” Ray adds that measurement of customer experiences can also prove problematic. “Often the ways that we measure new and innovative experiences are all wrong. Some of the greatest experiences that we value today didn’t start out being profitable rapidly. In fact, some of them aren’t profitable at all.” The report highlights Amazon Prime, which it says isn’t turning a profit for the online retailer largely because Amazon does not charge enough for Prime to compensate for all the free shipping and free content it provides. “by a narrow definition of ROI, you’d look at something like Prime and many brands wouldn’t do it,” Ray says. “But what we see, of course, is that Amazon is in fact thriving because of Prime, and the reason is that they evaluate their risks in a very different way,” Ray suggests that to offer those more innovative experiences, companies should shift attention away from an early expectation of financial ROI and instead begin to look at adoption. If people are adopting the new experience, “that would suggest that it’s serving needs and is worth putting more attention and investment into,” he says. He also suggests evaluating brand perception, asking whether people using this new experience feel differently about the company and whether they are more likely to recommend, and more likely to repurchase. If so, “that begins to suggest that there is real value both for customers and for the brand, ” Ray points out. Companies, then, also need to reconsider how they weight financial outcomes, Ray says, noting that it’s not necessarily about ROI but whether people spend more, are more likely to be retained, or have a higher lifetime value. “If you begin to think that way instead of about the ROI of each individual experience, you shift your focus toward the customer, and in a way that looks at leading indicators of brand success rather than lagging indicators of financial outcomes, he explains. Are you assisting in the buying process?